America’s Undersecretary of State for Africa, Tibor Nagy, recently rounded up a brief trip to some African countries including La Republique du Cameroun (LRC). Prior to his visit to LRC, Tibor Nagy granted interviews in France and South Africa signaling his mission to LRC will center on the Ambazonian liberation conflict. Irrespective of America’s geopolitical interest and the fight against Boko Haram, the Ambazonian liberation struggle has become the most important security, humanitarian and human rights issue between Washington and Yaoundé. Importantly, Washington considers Ambazonians as a people with the right to self-determination. In addition to suspending military aid, the Undersecretary raised the possibility of referring the Ambazonian conflict to an international forum. Though he did not mention any specific international forum, there is high probability the United States may refer the conflict to the Security Council of the United Nations. Washington demonstrates the gross violations of human rights now warrants an international humanitarian intervention. Though LRC will object on grounds of territorial integrity and state sovereignty, international law and practice have developed to the effect that humanitarian considerations trump state sovereignty. Evidently, Washington is fully aware that LRC has lost control of the Ambazonian conflict and cannot singlehandedly regain such control. Similarly, it is equally possible that Washington has recognized Ambazonia’s determination and capability to repel LRC. Also, Washington like other international players notably the African Commission on Human and Peoples’ Rights assert that Ambazonians have the right to self-determination. By consistently referring to Ambazonians as “Anglophone population” and calling for both sides to dialogue without pre-conditions, Washington recognizes Ambazonian legitimate right to self-determination under international law. Importantly, Tibor Nagy understands the current armed conflict is “a long-term historical crisis that goes back decades. It goes back to the union of the two parts of Cameroon. It goes back to the fact that the anglophone population of Cameroon have felt like second-class citizens for a long time.” By highlighting the “union” of the two Cameroons, Washington understands an international boundary separates the Ambazonia from LRC and the two countries represent different “peoples” under international law. 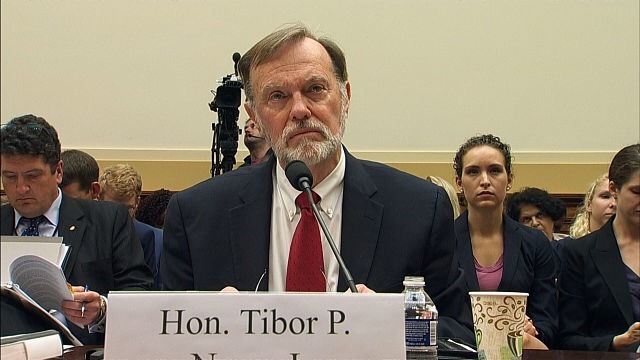 Interestingly, despite the military aid and personnel training offered to LRC recently, Tibor Nagy compares the Ambazonian conflict to the Vietnam war. He expressly warns LRC to remember that despite having a well-trained Army and using sophisticated weapons, America lost the Vietnam war. Aware of LRC’s military prowess, Washington raises this important element for possibly three significant reasons. First, LRC’s military arsenal and financial resources cannot sustain a long-term guerrilla warfare because Washington demonstrates more fact-based reasoning. Tibor Nagy understands the Ambazonian population supports Restoration Forces against LRC. Second, Tibor Nagy’s failure to outrightly condemn the constitution of Restoration forces indicates Washington recognizes Ambazonia’s right to self-defense. Thirdly, Washington understands the conflict is totally provoked by LRC and the people of Ambazonia identify with Ambazonian liberation movements acting in their defense. Importantly, Tibor showed great mastery of the conflict. Three of his declarations are worthy of note. Reacting to claims that Ambazonians living in the USA are sponsoring terrorism in LRC threatening to destabilize LRC, Tibor requested LRC supplies names of suspects and if Washington finds any compelling evidence that the accused have violated American Laws, American Courts will try them. This assertion outrightly flattened LRC’s claims that the USA will immediately return political activists to LRC. Unfortunately for LRC the USA is a state of law and the executive complies with judicial decisions. Besides the significance of the rule of law, Tibor referred to Restoration fighters as “Amba Boys”- a name commonly used in normal parlance in Ambazonia. Also, Tibor confessed he receives daily reports with images of gross human rights committed daily. Conclusively, American diplomatic conversations around the Ambazonian conflict proves America is the only super-power interested in resolving the conflict and protecting human life in Ambazonia. Fundamentally, Tibor Nagy’s declarations represent the American perspective and demonstrate America has a perfect understanding of the Ambazoninan conflict. It is equally compelling to note that LRC’s narrative and attempt to sell the Ambazonian revolution as a “terrorist” movement and an internal affair did not gain traction. The easiest solution to the Ambazonian conflict lies in revisiting the decolonization process, asserting Ambazonia’s right to external self-determination and recognizing Ambazonia’s independence in compliance with laws and resolutions organizing decolonization. As mentioned above, this conflict has been in the making for decades but caught international attention when it transformed into an armed conflict. Its armed nature projected the necessary force to call the world’s attention to the sufferings in Ambazonia. Some Ambazonians hold that Restoration forces have put them on the map of international issues and they must maintain and increase their stake militarily before negotiating terms of separation with LRC. They contend that negotiations at this point will disadvantage Ambazonia because Ambazonia will negotiate from a position of weakness. As true as this maybe, Ambazonian leadership must act in compliance with international law, understand the international political system and learn from previous liberation struggles like the Ambazonian revolution.